Fish impacted by red tide wash up in Florida. The state promises more than $1 million in funding for additional scientists tasked with aiding local efforts to save manatees, dolphins and sea turtles, and to help clean up the mess. But what is red tide? Here are some answers, along with links for further study. What is it? Red tide is the unscientific term for Harmful Algal Blooms (HABs). Specifically, microscopic marine algae called Karenia brevis grow rapidly, creating blooms that can appear red or brown, according to the U.S. Centers for Disease Control and Prevention. How often does it occur? Nearly every year, according to the governor’s office. It was documented along Florida’s Gulf Coast in the 1840s. This year, it has made headlines -- with an estimated 97 manatee deaths attributed to red tide, the Florida Fish and Wildlife Conservation Commission reports. Why is it a problem? These algal blooms produce toxic effects on people, fish, shellfish, marine mammals and birds, explains the National Oceanic and Atmospheric Administration. The surrounding air may also be difficult to breathe. What is the impact on humans? Toxins can concentrate in the tissues of shellfish. Anyone who eats the contaminated shellfish could get sick with “neurotoxic shellfish poisoning,” according to the CDC, which can “cause severe gastrointestinal and neurologic symptoms, such as tingling fingers or toes." National Oceanic and Atmospheric Administration (NOAA): What is red tide? Florida Fish and Wildlife Conservation Commission: 2018 Preliminary Red Tide Manatee Mortalities, Jan. 1- Aug. 8. U.S. Centers for Disease Control and Prevention: About Red Tide. Smithsonian Marine Station at Fort Pierce: Indian River Lagoon Species Inventory. 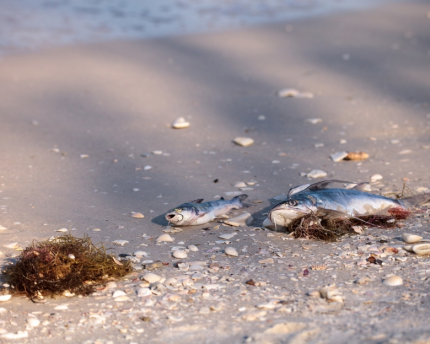 State of Florida: Governor Scott issues emergency order for red tide. Is global warming harming wildlife?